FatDog is an amalgam of two bands: the jazz trio Fattigfolket, and the folk trio Doggerland. Posterity will know that the groups joined forces one summer night in 2011, at a festival held on the Swedish Koster Islands. The result has been nothing less than remarkable: a group that has found a comfortable niche in combining Nordic and English folk, with plenty of room for improvisation. This allows FatDog's wind section (Gunnar Halle, trumpet; Hallvard Godal, saxophone and bass clarinet; Patrick Wingård, clarinet and flute) plenty of 'breathing room.' The group also features the vocals, concertina, guitar, and cittern work of Richard Burgess; the hurdy-gurdy of Anders Ådin; and the upright bass playing of Putte Johander. Swedish and Norwegian musicians have done wonders in adapting jazz music to the expanses of the north, in the manner of the ECM label artists. FatDog are on to something similar, and they remind me of a statelier version of Blowzabella. 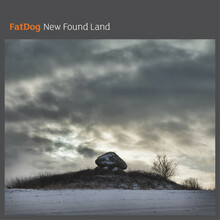 There's a deep, brooding, stark beauty to the group's sound, even when the group mesh on the up-tempo “Ring The Changes.” The juxtaposition of English folk tunes and Swedish sets is just terrific, and it is to FatDog's credit that New Found Land has a seamless, timeless quality about it. Joys abound, whether Halle's great trumpet solo on “Halling Etter Sjur Eldegard”; the motoring hurdy-gurdy on the live version of “Gubbvalsen,” with its complex interplay of bass clarinet and other wind instruments; and the terrific vocals of Burgess. “Sandansko Oro” is a wonderful Macedonian dance. An acapella version of “Hog-Eye” is a complete surprise, Burgess whooping it up and the rest of the band joining in with great relish. “Bay of Biscay” is sung to a concertina, and the effect is a mournful hymn.